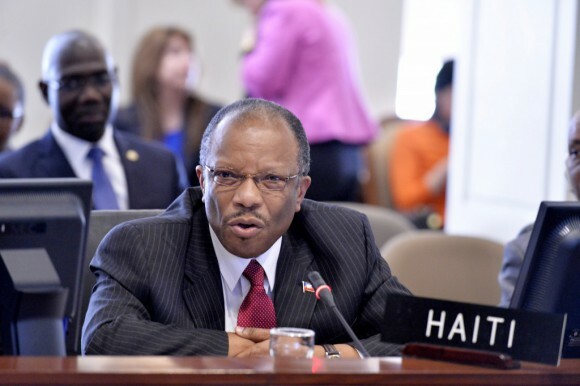 Haiti Foreign minister Pierre Duly Brutus [see above] said his country will ask the Dominican Government to extend the deadline of the National Plan to Regularize Foreigners, which expires October 28. In a joint press conference after meeting with Dominican counterpart Andrés Navarro at the Foreign Affairs Ministry, Brutus said Port-au-Prince has yet to determine for how long it will make the request, but it won’t be made until his nation issues documents to its nationals for that purpose. “For the process of documentation, I will ask for an extension from my colleagues in the Dominican Government,” the Haitian official said. Trade: When asked about establishing an area of free trade between the Dominican Republic and Haiti, Brutus agreed, but noted that only after his country solves some of its shortcomings.